The Miniscreen is an integrated machine consisting of a perforated screen, a spiral and a geared Motor unit. This screen has been specifically designed for Fine Screening applications for waste water treatment plants. 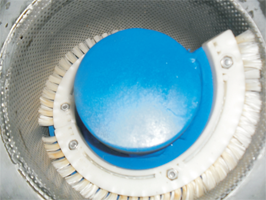 During operation, after a coarse screen, fine solids in the incoming flow will progressively collect onto the screen mesh and the water shall filter through the mesh and will be passed into the channel or tank. The captured fine solids on the screen mesh will be cleaned with the help of the brushes fixed to the periphery of the spiral in the screen mesh zone will clean the screen mesh and convey the solids up to the outlet. Easy collection of the solid material in a Bin or a Bag. Suitable for Pipe flange mounting as well as channel installation. Openings available in 2 mm, 3 mm & 5 mm perforated / punched holes. MOC screen and housing in SS 304 and screw in hot dip galvanised steel. 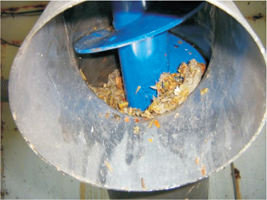 Before MBR in Sewage Treatment Plant and Effluent Treatment Plant. Fine screening application in STP and ETP. Commercial places like restaurants and fast food outlets, laundries, carwash, etc. Textile, Paper and Slaughter house industries. Note : * Flow rates may vary as per application.